"Find It Now, Find It Fast"
What would we do better next time (or if we had more time)? Our project involves the construction of a telescope mount which automatically rotates a telescope to track a star selected by the user. This project intends to create an automatic application for users who wish to track stars without the hassle of adjusting the telescope themselves. 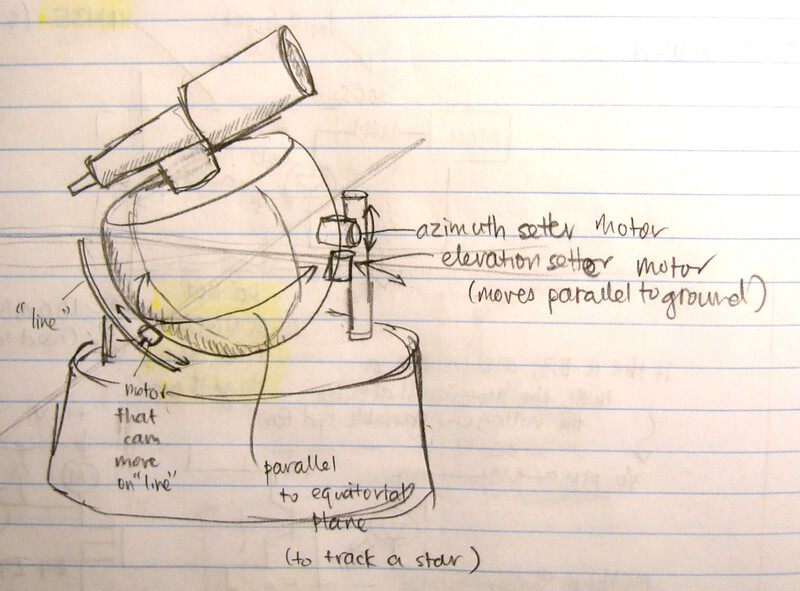 Users would be able to track a given list of stars, or input their own data for the telescope mount to track their own desired star. The project consist of two main components: the mechanical construction of the mount and the software required in accepting user input and operating the mount itself. 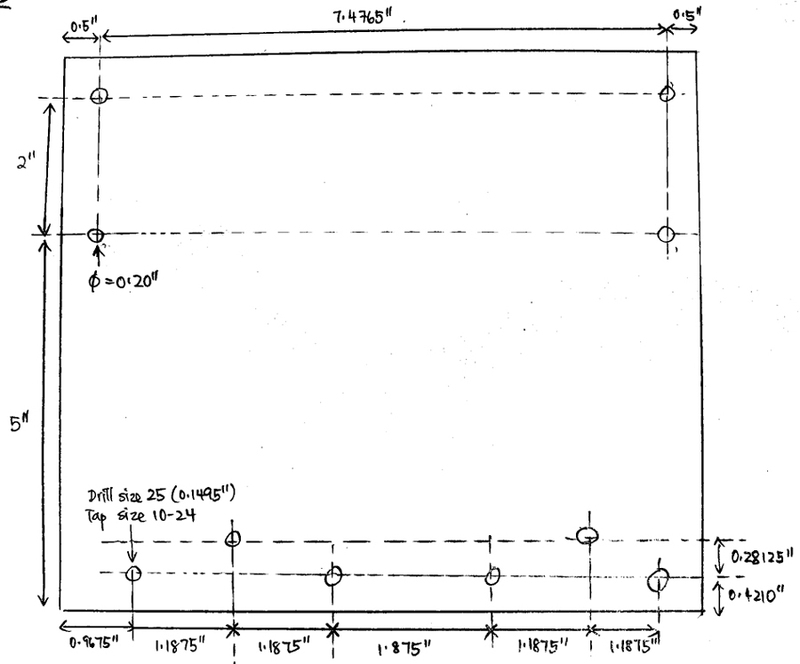 Figure 1.1.1: Our Project Group. Click to enlarge. We wanted out project to have a significant hardware and software component. By choosing to design and build a telescope mount, we were be able to accomplish this. The mount would require significant machining, along with the addition of electrical components such as a motor, pulleys, an LCD screen, a keypad and a Mega32 MCU, which would give us experience in hardware design. The software to accept user input, calculate local sidereal time (LST), find the coordinates of a given star, and operate the motor would do the same in software design. We also deemed that the project would fit within the budget constraints. The mount was constructed out of scrap metal scavenged from the machine shop, while the pulleys, motor and screws were sampled and donated from companies like [Lin Engineering]. Most of the cost went towards using the LCD, keypad and Mega32 components. The project was also motivated from Ian’s love of star/aurora-watching. The idea was further strengthened by a website by Jerry Oltion [link], which was our original challenge. However, his idea was too difficult to implement in the short period of time we were given and therefore we decided to simplify it. We also decided this would be an innovative use of scrap materials and some electrical components. The precise tracking of a star requires calculations to determine the elevation and azimuth of a star, given its right ascension, declination and exact time at which it is being tracked. The software has to calculate the local sidereal time of the observation, and together with information of the user’s location, is able to determine where the star will be in the sky. The local sidereal time is synchronized to the movement of stars across the sky, just as the local solar time is synchronized to the movement of the sun across the sky. Declination and right ascension are like latitude and longitude coordinates for a star. Declination is measured in degrees from the equatorial plane, while right ascension is measured in degrees or hours right of the First Point of Aries. Before the time can be used to track a star, it needs to be converted to the local sidereal time. This is because local solar time does not progress at the same rate as sidereal time. Suppose the earth did not rotate at all. During the course of a year, to an observer at a point on the earth, the sun will appear to make a full rotation around the earth, because of the earth's motion around the sun. However, the earth does not rotate around the stars, so this "extra" day must be compensated for. Because of the way the earth rotates around the sun, its motion actually cancels out one full rotation about its axis. Thus, while there are 365.25 solar days in a year, there are 366.25 sidereal days in a year. Each solar day is 366.25/365.25*24*60*60 sidereal seconds = 86636.55031 sidereal seconds, so for each solar day from this epoch, we added 86636.55031 seconds to the time. Each solar hour is 3609.856263 sidereal seconds. Each solar minute is 60.16427105 sidereal seconds. Each solar second is 1.002737851 sidereal seconds, so this was added for the time past a complete solar day. Calculate the longitude offset due to longitude. Each degree of longitude west of Greenwich subtracts 240 seconds from Greenwich sidereal time. Local sidereal time is the number of sidereal seconds past Jan 1, 2007 12AM, added to 6:38:18.1 = 23898.1 seconds, added to the longitude offset, mod 86400. There are two reference frames used in our code. One is the ground plane, that is the x- and y-axes span the ground plane, with the z-axis pointing to the zenith. 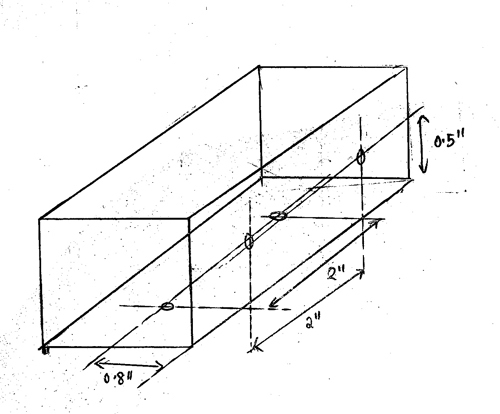 The other reference frame is the equatorial reference frame, used to position the telescope, since it is tilted at an angle parallel to the equatorial plane. In this reference frame, the x- and y-axes span the equatorial plane, while the z-axis points to the star Polaris. Let the latitude of the observer be λ. Let the vector from the observer to the star be , where , and . We need to rotate to , where , and . With , we need to find the elevation and azimuth in the equatorial reference frame. atan2 produces a result between -pi and pi, so we need to convert this to degrees between 0 and 360. The MCU acts as a controller for both the user input and the motor turning the telescope. The LCD screen prints out prompts for certain data for the user, who uses the keypad to input the required information. 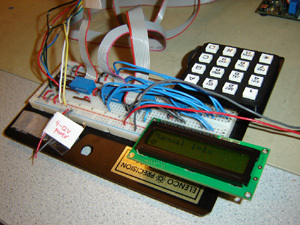 The motor, LCD and keypad are connected to the microcontroller board via the usual 8-pin connections. The mount is constructed out by milling, drilling and lathing scrap pieces of metal obtained from the machine shop and then built together using screws, hinges and bolts. The design was thought out and drawn by us. Figure 2.5.1: Picture of our setup. Click to enlarge. We initially wanted to implement a gear system to move our telescope mount when tracking a star. However, due to difficulty in finding suitable low-cost parts, we decided to forgo the idea and instead implement the pulley system which was much easier and the parts were easier to sample and find. Our telescope mount was designed in accordance to the IEEE standards as specified on their website [www.ieee.org]. The Hours:Minutes:Seconds timekeeping in our program should conform to the Coordinated Universal Time (UTC) standard, although the time inputs are set by the users. Our project does not communicate with other devices. In order for a technology to be patentable, it must be considered both useful and non-obvious. Our telescope mount was designed and implemented by us. However, there are patents that deal with equatorial mounts similar to ours. These include United States Patent 4050318 [Sidereal rate drive mechanism for a telescope mount], and United States Patent 5062699 [Pivotless equatorial table for a telescope]. 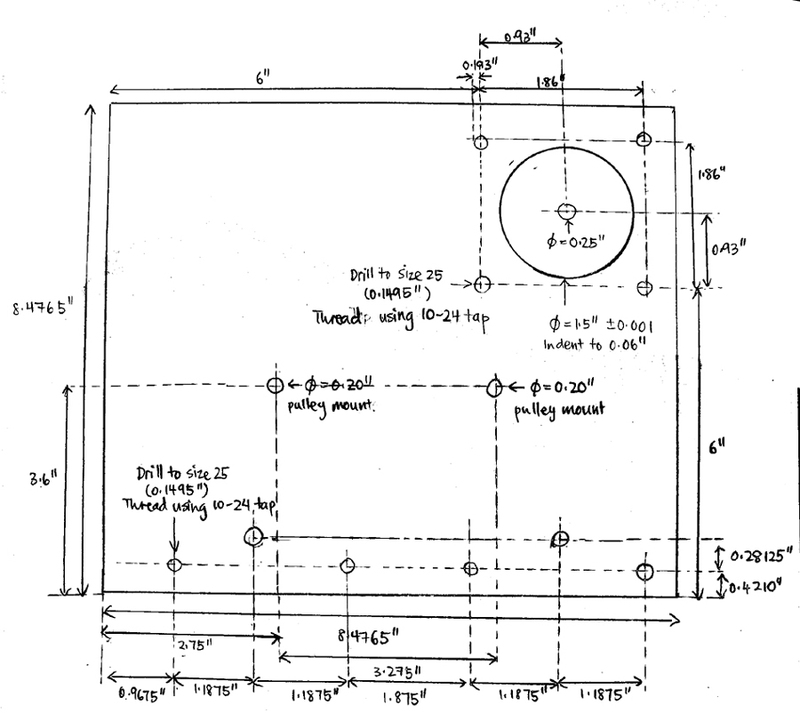 None of these patents, however, specifically address a telescope mount built on a platform made from two pieces of metal and a door hinge, moved with pulleys. The LCD, keypad and MCU are widespread devices and would be obvious. They would therefore not conflict with any current patents. We also wrote the software ourselves and would not violate any copyrights or trademarks. The base, lid and sides of the mount and the pulley rods were made from scrap metal obtained in the machine shop. These were machined according to the specifications listed in [Appendix B]. Figure 3.1.1: Picture of the front of the mount. Click to enlarge. Figure 3.1.2: Picture of the back of the mount. Click to enlarge. 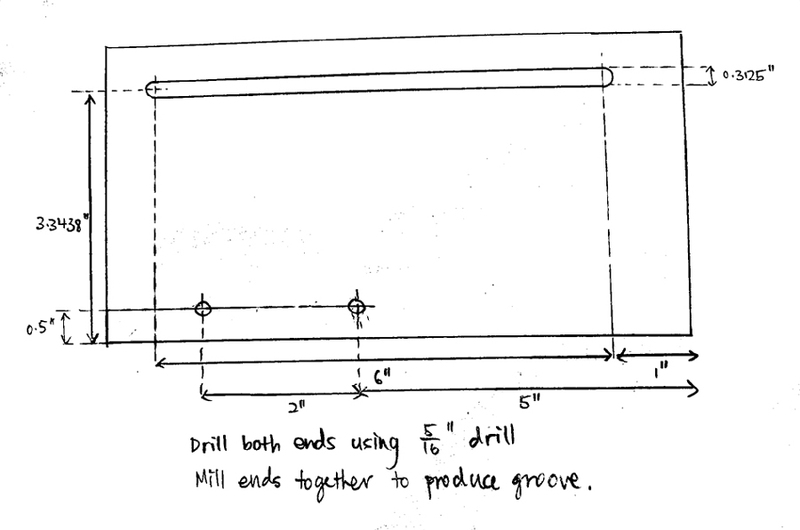 Figure 3.1.3: How we mounted the pulleys. Click to enlarge. The ATMEL Mega32 microcontroller is housed on the STK500 board provided by ECE 476. The MCU is powered by a 12V power source. The PORTs A, C and D are used to provide input and output to the LCD screen, keypad and stepper motor controller respectively. 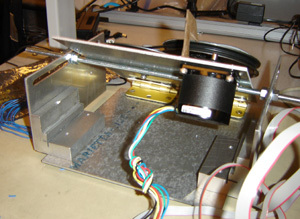 The stepper motor controller (UDx-2559B-T) was sampled from Allegro. The stepper motor (5618S-54) was sampled from Lin Engineering. It moves 1.8 degrees per step. The power needed for the motor is around 12V and 1A. Our power supply for the motor is a 9V-12V supply. This was scavenged from leftovers from last year’s projects. The LCD screen that we used was the one provided in the ECE 476 lab. This screen was used to output prompts for user inputs. The keypad we used was the one provided in the ECE 476 lab. 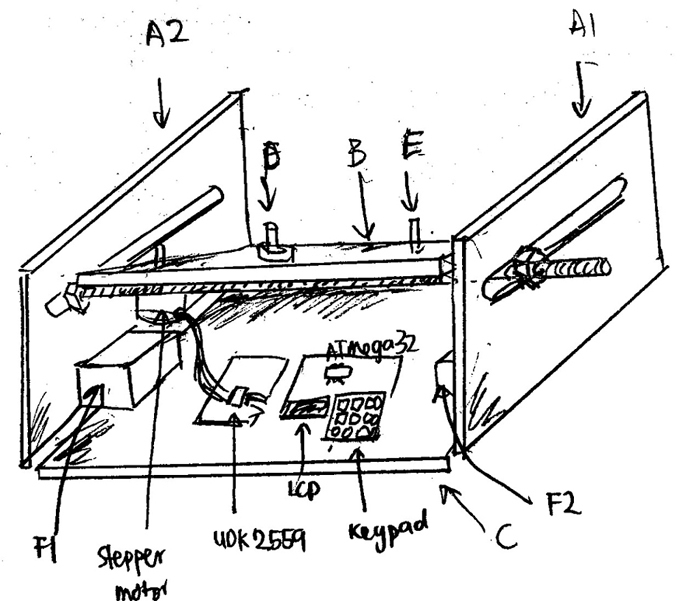 This keypad is used by the user to input the desired parameters for using the telescope mount. 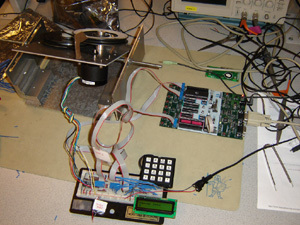 We used the provided protoboard to provide access to the LCD screen, keypad and to house the stepper motor controller. 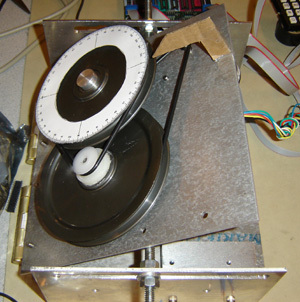 As we intended, the stepper motor is connected to the pulley system via an O-ring. 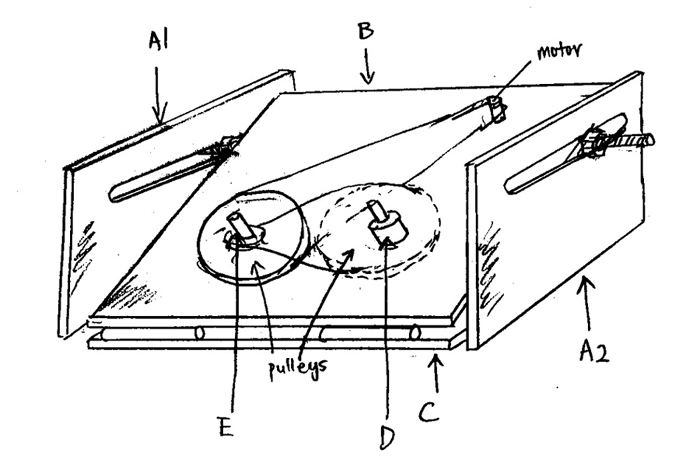 As the motor turns, the pulleys rotate and turn the telescope as needed. The elevation of the telescope can be adjusted by sliding the horizontal rod back and forth the slit along the side plates. One calculation that we had to take into account here was the step-down of the rotation ratio between the motor and the pulleys. We had to had a 1:80 step-down ratio in order to accurately position our telescope. By utilizing pulleys of different radii, we were able to achieve the necessary step-down. 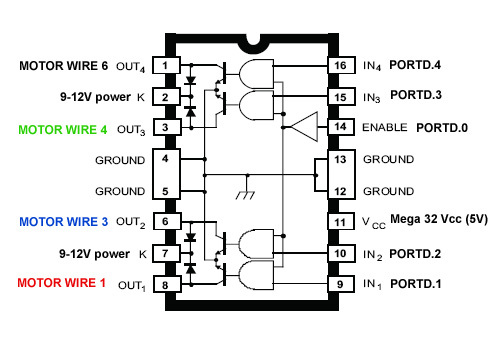 Figure 3.2.2: Wiring diagram for the stepper motor controller (UDx2559B-T). Click to enlarge. Figure 3.2.3: Whiteboard, Keypad, LCD, stepper motor controller. Click to enlarge. We tried soldering our own custom PC board and protoboard to save costs. These worked well all the way throughout the lab until they suffered a catastrophic failure without reason. We tried for hours to debug the circuit boards, with help from the TA's, but were unable to discern a reason for the sudden failure. We had to use the STK500 instead. Fortunately, we were only just able to meet our budget, thanks to the large amount of scrap we managed to acquire at the Emerson Lab. Our program consists of a few main parts. The main state machine controls the user inputs, while two separate functions calculated the local sidereal time and the elevation and azimuth of the desired star to be tracked. Other functions include control for the keypad and the motor. There are two modes of operation: manual and automatic. In manual mode, the user uses the scroll buttons to move the motor as he/she wishes. In automatic mode, the user enters the star coordinates (or chooses them from a list) and his time and location, and the program will automatically calculate where to point the telescope to. Tracking can be done in either mode. This code initializes all the variables used in the project code and resets all state machines to their initial states. 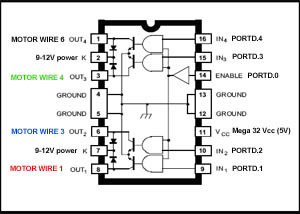 PORTs D, A and C are initialized for motor controller output, keypad input and LCD output respectively. Both Timer0 and Timer1 on the ATMega32 are also both initialized here. The initial date variables are set to initialized to Jan 1, 2004, 12 midnight GMT. Star information is stored into arrays here as well. Timer0 interrupt is called every millisecond. This gives us an accurate internal clock that keeps track of the time that has elapsed. Timer1 interrupt is called every 1/1000 sidereal second. This is so as to rotate the mount to track the star as it moves every sidereal second. We wrote our own code to that communicated with the motor through the stepper motor controller. 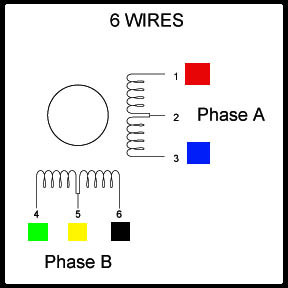 The stepper motor has 4 coils that when sent certain signals in a certain sequence would step the motor clockwise or anticlockwise either in full or half steps. 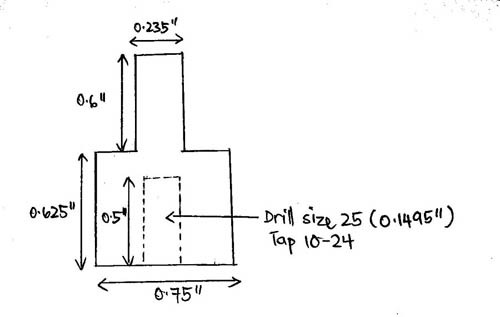 From Figure 3.2.1, the coils were asserted in the following order: 1, 4, 3, 6, 1,... for full steps, and 1, 1+4, 4, 4+3, 3, 3+6, 6, 6+1, 1,... for half steps. Using the right ascension and declination, we calculate the elevation and azimuth in radians. We then perform the coordinate frame rotation (as discussed in Background Math) to obtain the true elevation and azimuth of the star relative to our location. Special attention was paid to the units. All angles were converted to decimal degrees, and times converted to seconds. For the math.h trigonometric functions, the degrees were converted to radians. The keypad control code was reused from the previous ECE 476 labs with the addition of a few buttons. The standard 0-9 keys were preserved, with the addition of "-" and “.” keys for floating point input. A “backspace” button was also included to correct typing errors. With a star list that we had to display on the LCD screen, we also decided to implement “Scroll Up” and “Scroll Down” buttons. These buttons are also used to manually calibrate and move the telescope mount. After the users input the required data, they are given an option on their subsequent use of the mount to keep using the old information (i.e. track the previous star). This gives them an easy way to automatically revert to the star that they have been tracking. The state machine also consists of different tracking modes which the user can choose from. - The program uses this mode to move the telescope orientation towards the desired star to be tracked. - Users will be able to use this mode to center the telescope on the desired star before enabling automatic tracking. Moving the telescope in this mode does not affect the stored azimuth variables, so the telescope can be calibrated to point to the correct direction. - The motor on the mount will automatically turn the telescope to track the desired star at the correct speed. - Users are able to manually operate the mount to track the telescope by sight instead of using the automatic track functions. The telescope mount is functional and working properly. The state machine that we designed for user input works as intended in acquiring the required data for star tracking. The telescope mount rotates the telescope right after the calculations of the star position are done. There is also little or no downtime between using the keypad buttons to calibrate the telescope mount’s orientation. The local sidereal time interrupt executes every 15956 cycles (at 62.5ns) to increment the local sidereal time clock. This is approximately 1/1000 of a sidereal second. In reality, this clock should be executing every 15956.16 cycles. However, this is not possible with the ATmega 32. Thus, we gain 0.28415 cycles every 1/1000 sidereal second, or 0.63934 sec every 10 hours. This is acceptable since we do not intend to be running the mount for more than 2-3 hours. There is also a limit to the floating point accuracy when calculating the number of seconds that passed since our epoch. With the high step accuracy of our motor and our step-down pulley system, we were able accurately track the position of a star to within approximately 0.01 degree. However, the rotation of the telescope to the star's position has an accuracy of 0.5 degrees, due to the accuracy of floating point division. Our various tracking modes also work as intended; the user is able to calibrate the telescope manually and fast tracking mode for the telescope mount rotates the telescope ten times faster. We are satisfied with the construction of the mount as it is stable and solid enough to support and turn a telescope. Safety was observed throughout the construction of the mount. We complied with all the rules and regulations of the Emerson Lab machine shop while using the machines. We enrolled in the Basic Machining course taught by George Petry to be fully certified to use the red apron machines - the mills and the lathes. Safety goggles were worn at all times in the machine shop, and we took care to observe all the safety procedures while using the machines. In the ECE 476 lab, we made sure to solder our boards properly and safely. All this was also done in the consideration of those working with and near us. Therefore, no one was hurt during the process of the entire project. We did not in any way interfere with other people’s projects, making sure that our mount parts and boards were kept away from others. The user interface of the telescope mount is simple and easily understandable. This makes is usable for almost everyone. The initial idea of building a telescope mount was extremely daunting. The designing and machining aspects were deemed too hard and time-consuming that we were worried that we would not finish the project on time. However, after we scaled down our designs and obtained the materials, we were able to make relatively quick progress on the mount. The code was written with relatively few bugs. The few problems which arose was when we were dealing with printing float variables to the LCD screen and also scrolling through the list of stars on the LCD screen. The two functions that we used to calculate LST and rotate coordinate frames were also particularly challenging to write. We were able to overcome these few difficulties and finished the project. We are extremely happy that the telescope mount is fully functional. Given more time or a larger budget, we would add a Hall sensor to our mount, which would detect the rotation of the mount and provide feedback as to its actual direction, to enable us to more accurately track a star. We would also add a motor to control the elevation of the mount, so that the process can be more automated. Currently the user has to manually adjust the elevation of the mount. 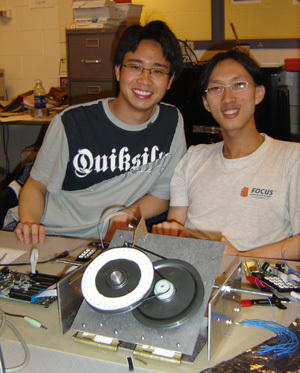 Other than the formulas obtained from a website mentioned earlier, all circuits, digital code and mechanical designs were built and written by Ian Quek and Kevin Goh. There are no patent opportunities for our project. We did not have to sign any non-disclosures to get sample parts. We took all precautions in machining our mount safely and also to observe all safety regulations while in the lab. We spoke with our TA and professors throughout the course of the project for advice and consultations. We have specified our limits and goals clearly throughout the project. We have also been honest about reached goals and unreached goals in this report. We were not offered any bribes for our work. Any donations of materials are stated as such. We wanted to expand our project to include both technical and mechanical aspects in order to learn more. We never tried any hazardous and potentially dangerous tasks that would not be satisfied by our technical knowledge in this project. We have stated clearly our sources of information throughout the project. As mentioned, we observed all safety rules and regulations. There are no legal considerations for us since we do not transmit anything. Please click on this [link] for the C code. 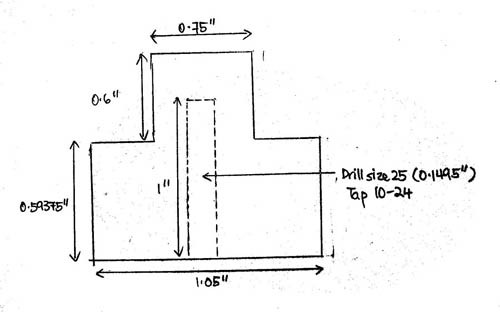 Figure B.8: Part F: Holder for Part A. Connects the base to the threaded rod holder.